Already through to the Turkish Airlines Euroleague Playoffs, FC Barcelona Regal extended its winning run to nine games with an 86-61 win over Besiktas JK Istanbul on Friday night. 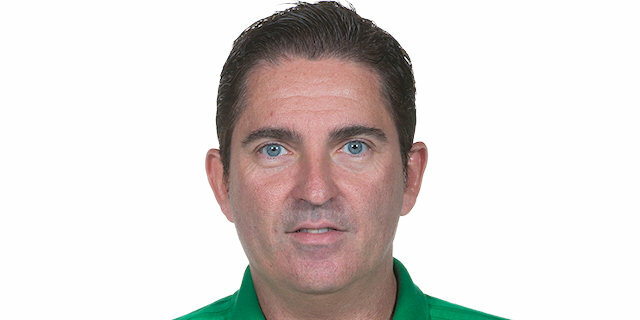 The win ensured Coach Xavi Pascual’s men at least a top two finish in Top 16 Group F and home-court advantage in the playoffs. The Spanish champs led from start to finish, opening the game on an 11-2 tear and outscoring Besiktas in all four quarters to cruise to a league-best 10-1 record. 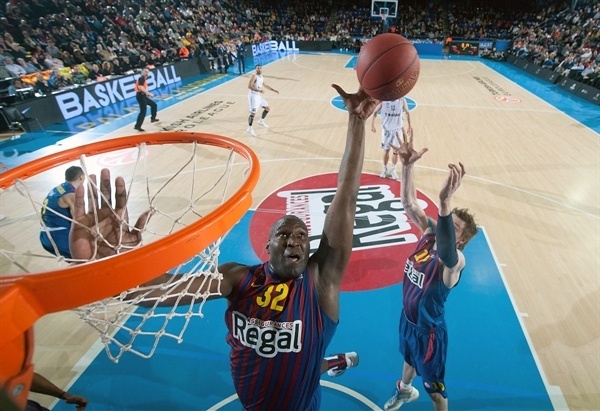 Nate Jawai paced Barca with 16 points, 9 rebounds and some earth-shattering slams. 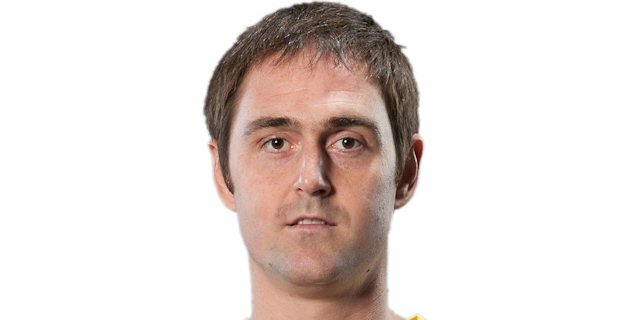 Erazem Lorbek added 12 points and Ante Tomic and Pete Mickeal each chipped in with 11. Cevher Ozer scored a career-high 18 points in defeat and Gasper Vidmar netted 13 for winless Besiktas. Barcelona set the pace early, going 5-0 ahead and grabbing 2 rebounds in the opening minute. Lorbek was a big first quarter presence for the home side, combining with February’s MVP of the Month, Ante Tomic in the paint. 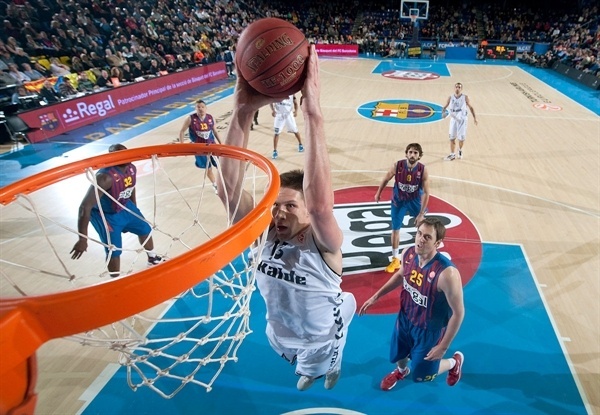 Barcelona established a 17-4 lead less than halfway into the quarter, with Besiktas’s only points coming from Vidmar’s muscular dunks. Hitting shots from inside and out, Barcelona was varying its play, dominating the boards –both on offense and defense – and getting all of its players involved. Getting all of its starters on the scoresheet, Barcelona also gave first quarter cameos to the likes of Sarunas Jasikevicius, who hit a deep three-pointer to announce his arrival on court. Besiktas was only having joy through Vidmar, whose impressive slams were the bright spot of the quarter for the visitors. With 8 points of Besiktas’s 15 coming from the hands of its center, it was clear who the man to stop would be for the remainder of the night. Barcelona went into the first break with a 29-15 advantage, with Lorbek its standout through his 12 points and 3 rebounds. Resting Lorbek and scoring king Juan Carlos Navarro at the start of the second quarter, Barcelona used the presence of Jawai in the paint to keep the scoring and rebounding up. A trademark dunk off CJ Wallace’s hand-off got Jawai hot, and he was a key man on the defensive boards. After Wallace hit a triple, Jawai again put down a highlight reel slam and Besiktas called a timeout. The opposition decided to go outside, and Ozer traded three-pointers with Barcelona’s Victor Sada as the advantage increased to 39-20 midway through the quarter. Players like Xavier Rabaseda and Alex Abrines were introduced to keep Barcelona fresh, as the local side looked to manage and extend the advantage. While Besiktas maintained its strategy of shooting frequently from downtown, Abrines hit a three-pointer of his own for Barcelona and the difference between the two teams teetered on the 20-point mark. After Besiktas 2 two free throws and Abrines missed his second attempt from beyond the arc, the first half concluded with Barcelona in front 47-31. Jawai, Lorbek and Navarro were put back onto the floor for the start of the third quarter, and the former added another dunk to his collection for the night with the half barely underway. 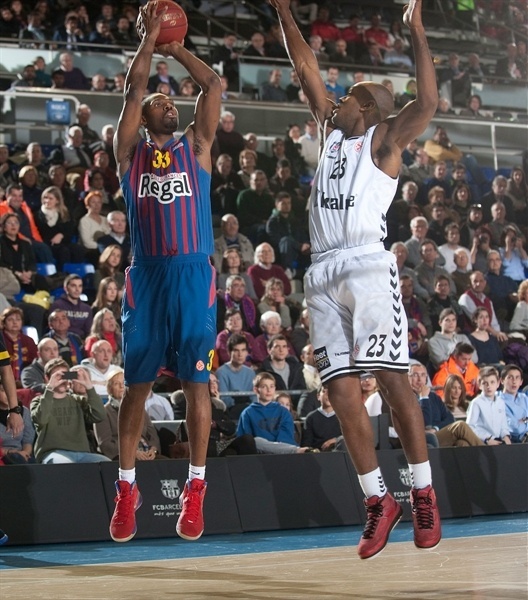 The reappearance of Mickeal also had an impact for Barcelona, as he combined with the hard working Marcelinho Huertas to make it a 20-point game. Besiktas fired back through Vidmar’s inside shot and Ricky Minard’s bucket from beyond the arc, but could not string together consecutive field goals with regularity. 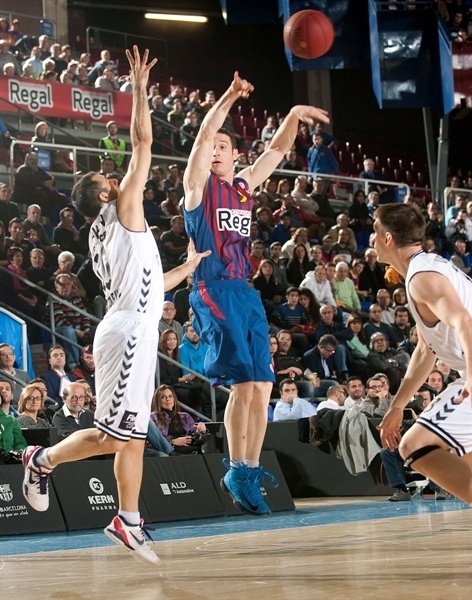 The visitors did pull the deficit back to 13 points, until Barcelona introduced a new scorer to the game in Marko Todorovic. He announced his arrival with a three-pointer, before teammate Mickeal got into another streak –one that put him into double-digits and Barcelona 63-47 ahead. Every player on the Barcelona roster for the night had scored points, but Besiktas’s duo of Vidmar and Ozer were taking the scoring responsibility for the visiting team on their shoulders. 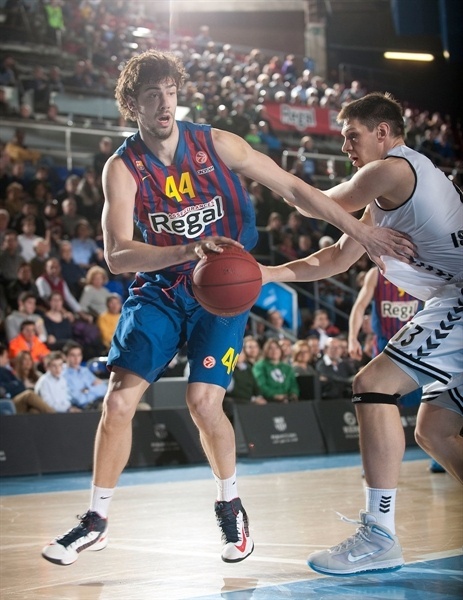 The 67-50 disparity at the end of the third quarter was not insurmountable, but Barça was firmly in the driving seat. Besiktas stayed true to its outside shooting strategy, and found success early in the fourth quarter through Patrick Christopher. Barcelona’s guards doubled up on Besiktas’s most dangerous players when they had the ball on the perimeter, and forced a series of turnovers. Shots from three-point land from Can Firket Akin and Barcelona’s Marcelinho showed the equality present beyond the arc, while inside the reintroduction of Jawai allowed Barcelona to power on through to the final buzzer, as he moved into double-digits on scoring and pulled down his ninth rebound. 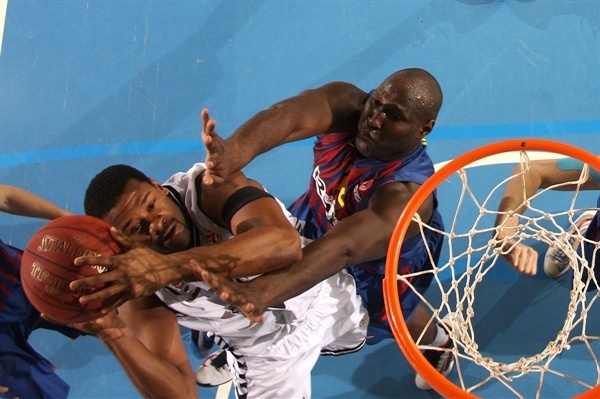 Late, deep triples were the only option for Besiktas, but even when successful, Barcelona was able to respond in kind. The game ended 86-61 to the home team, who continue a formidable winning streak. "We’re happy with another win. It’s another win in this competition, which is always important. One of our objectives at the start of the season was to clinch at least second place in the group, to get the home-court advantage. We played well tonight. We were able to pass the ball well and create, so we’re happy with our performance. We got an early lead, and right through to the end of the game we were able to maintain the advantage and manage the lead, which was around 20 points at times. We were also able to play some less frequently featured players here, which is good for us with Spanish league games being played on the weekend. It’s important that we got this win tonight and we have to do the same against Caja Laboral, so we that we can qualify top of the group. Lots of things can happen in the other group, which looks very tight. " "They were the better side, and you can see that clearly on the statistics sheet. In the first quarter they scored 29 points, which is too much. We were able to level out the play by producing some of our best basketball, but it wasn’t enough. We have to be objective. The focus for us, as we are unfortunately unable to progress in the Euroleague, is on the domestic league. 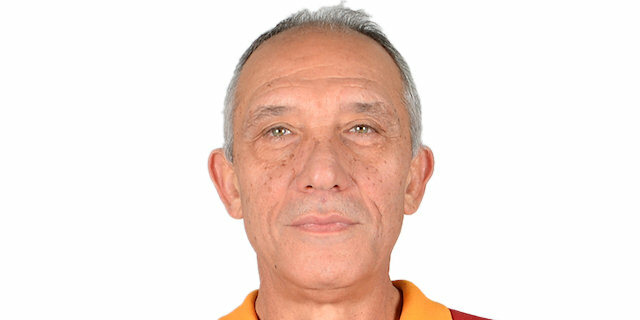 We are still determined to win against Montepaschi Siena in the next game, however, even if it won’t be easy." "The main goal today was to get this win and earn the home-court advantage, which was our first goal in the regular season and now in the Top 16. We have a long way to go to see if we can top the group, three more games, and hopefully winning one can secure us first place. That was our main objective in this phase of the competition. We’re happy that we played another great game against a team that could play without pressure. We have many weapons – not just offensively but defensively too. We’re a team that can do a bunch of different matchups and find a good chemistry, whoever is on the court. We’re strong and we’ve shown this year how much we want to get back to the Final Four. We just need to keep playing the same way to reach another goal. " "It was a good game, an important game, to secure a spot in the first two. We set that out as a goal at the start of the Top 16, that we wanted to win all our home games, and so far we’re doing a good job. 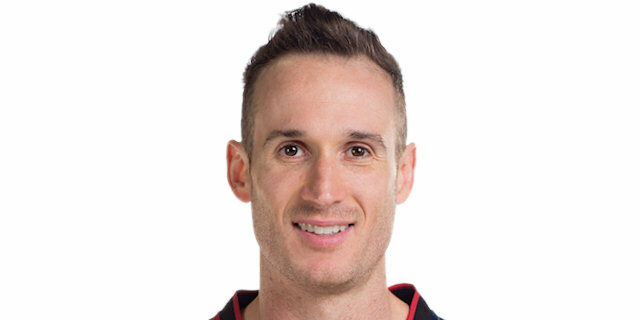 I just hope that playing at home will be the key factor. Last year we had home-court advantage and were very good, but playing games against teams in places like Kazan means traveling really far. It’s definitely beneficial not to go very far to play and we prefer to keep our fans alongside us. We set the tone from the start in this game, we wanted to control the game and I think we did a good job." "They’re a tough team and this is a tough court to go to. They play really well together; they’re an experienced team and well coached. We needed to play a pretty much flawless game if we were going to beat them. We’re out there fighting, trying to win some games, but they are a very strong team of players. We do a lot of scouting and watch tapes to try and prepare for these games, to stop their strengths. They made some shots that we had to live with in the middle of the paint in the first quarter. Those kinds of things we definitely try to limit, but they put a lot of those shots away in the first quarter and gained some momentum. They didn’t really look back from there. We’re always honored to be playing in the Euroleague and we come out to compete every time, and it’s an opportunity for us, a young team, to challenge ourselves against great teams."